Maryland Department of Commerce’s Carla Merritt and Montgomery County Economic Development Corporation Lynne Benzion presenting Boscobel President and CEO Joyce Bosc with certificates. SILVER SPRING, Md. – Boscobel Marketing Communications, Washington, D.C.’s top PR firm exclusively focused on government contractors, announced today it has been recognized by the Maryland Department of Commerce and Montgomery County government for 40 years of operations in Silver Spring, Maryland. Boscobel CEO and President Joyce Bosc, a lifetime resident of Montgomery County, founded Boscobel in 1978. One of Boscobel’s earliest highlights was the development of the brand, logo and commercial launch of America Online (AOL). Boscobel has since transitioned to serve the federal government industry, earning awards and recognition for being a top technology marketing firm dedicated to the government contracting community. 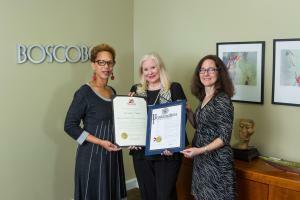 “We congratulate Boscobel Marketing Communications on its 40th anniversary and salute the creative success Boscobel has provided to businesses in Montgomery County and beyond,” adds Hans Riemer, Montgomery County Council president. Boscobel has been featured in business and trade media outlets such as PSC’s Service Contractor Magazine, Washington Business Journal, Washington Technology and WashingtonExec. Earlier this month, Boscobel published its 2018 report of corporate slogans for the top 100 contractors in the government industry. The firm also maintains a monthly blog, FedBizBeat, dedicated to providing executives with the best practices in government contracting. Boscobel is a full-service digital and traditional public relations and marketing firm exclusively focused on government contractors. Since opening its doors 40 years ago, Boscobel has differentiated clients with industry-first, innovative solutions that elevate profiles and establish brands including practices in M&A communications and RFP marketing. Clients specialize in artificial intelligence, cybersecurity, engineering, big data, enterprise IT, mobility, health care IT and more. Boscobel is a certified Woman-Owned Small Business. For more information, visit www.boscobel.com or follow us on Twitter at @BoscobelMktg.